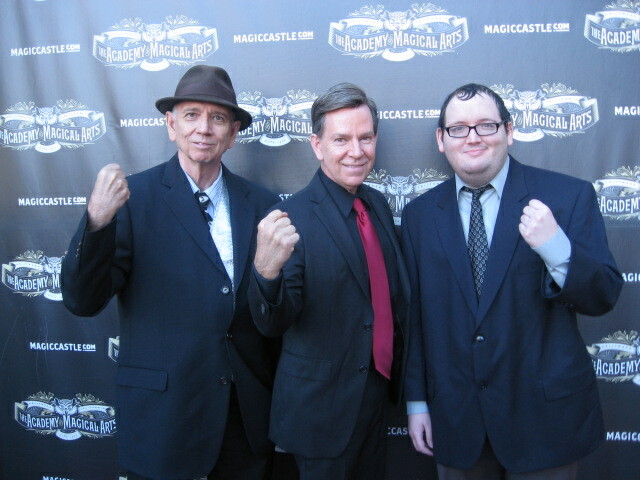 Despite the catchy title, this will be the last and probably least interesting of the blogs devoted to last week’s trip to Los Angeles and the Magic Castle. 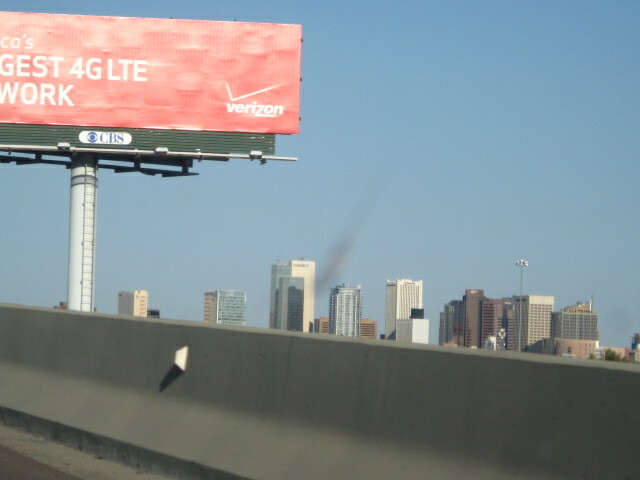 This blog is a catch-all for pix I took on the way in, while I was there, and on Tuesday when I headed back home. 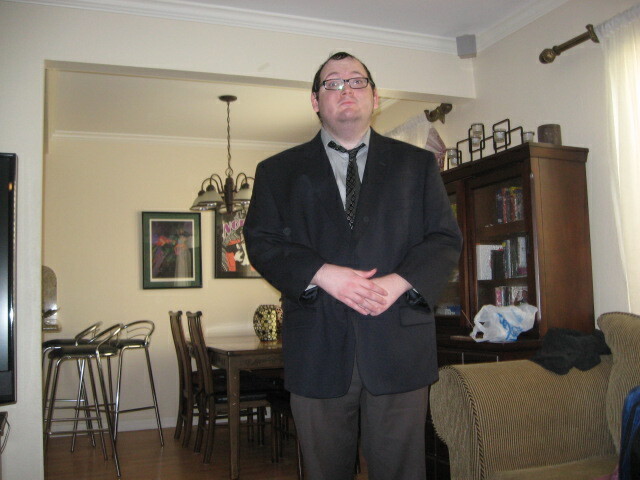 I think there are a couple of pix worth seeing, and I’m not competing with anyone for most interesting blog every time. This site is a kind of photo diary for me, of things that entertained me at the time. So grab a cold one, jump in the imaginary car, and come on a trip to Los Angeles and the subsequent escape from it with me. 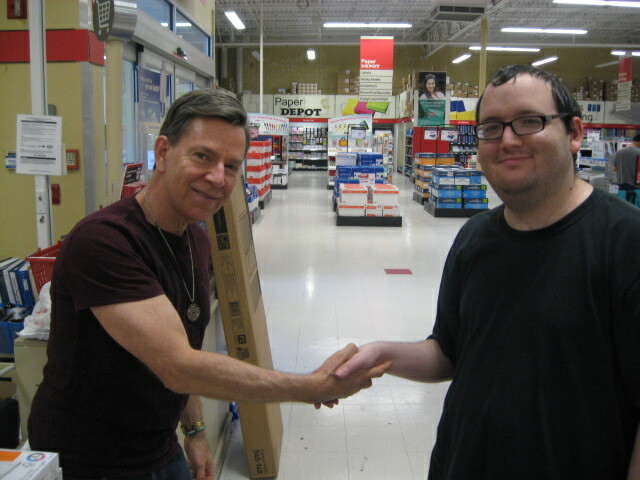 Mark Anthony, my magician host, talked me into buying a new memory card for my camera, and we had to test it, so I had him shake hands with my son James St. Andre on Sunday afternoon after we arrived. 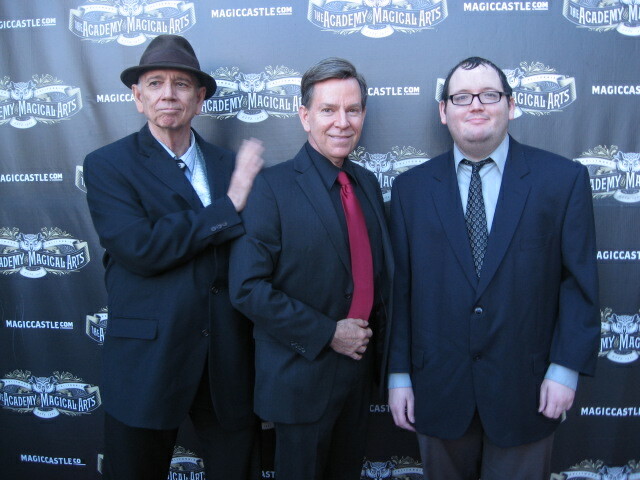 James looks uncomfortable as he gets dressed up for our first visit to the Magic Castle on Sunday evening. 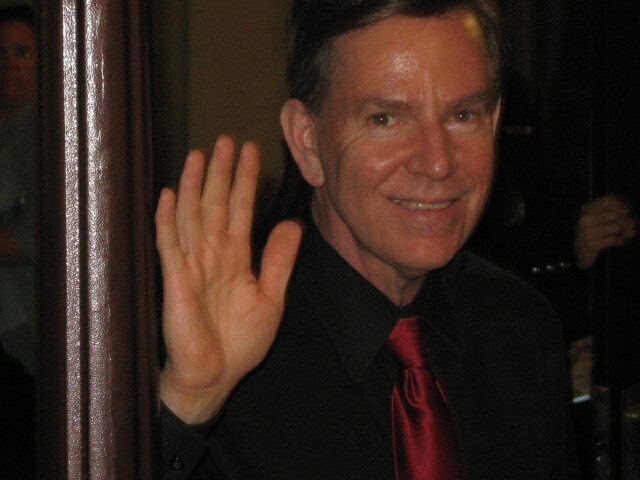 Wave to the camera, Ken. 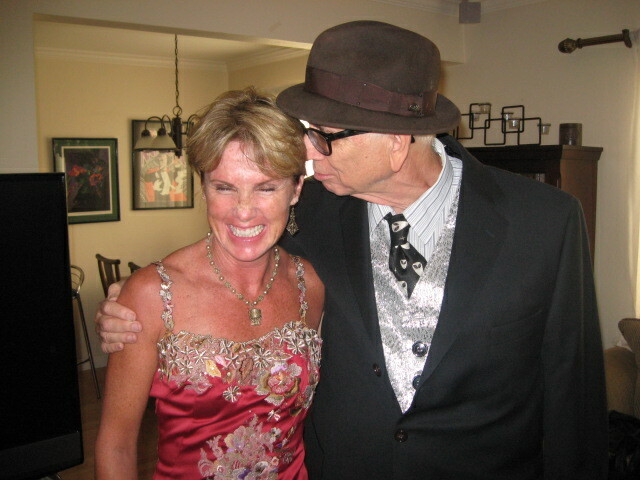 Ken gets a hug and a smile from Mark’s date, Jo. 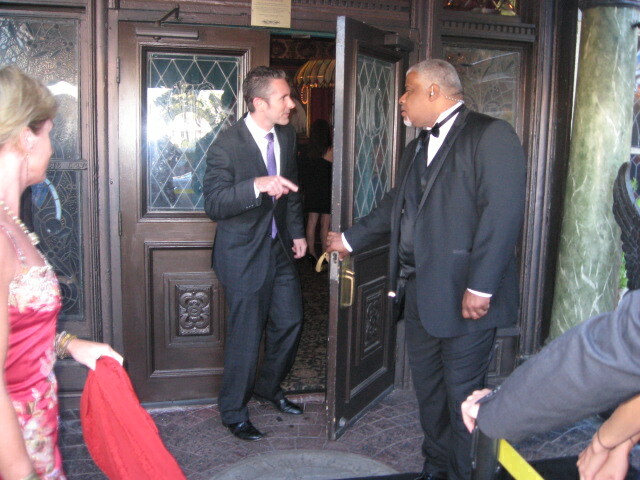 The front door of the Magic Castle. No cameras allowed to be used beyond this point. Grrrrr! Mark and Jo in the posing area. Mark likes black and red for his magical colors. Three amigos: Ken, Mark, and James. Here we are looking dynamic. I wanted to do the 3 Monkeys pose. Oops! 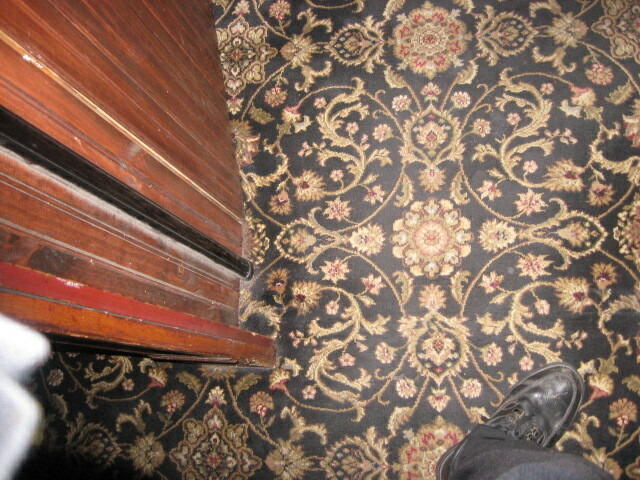 I got a camera shot of the carpet inside by accident. 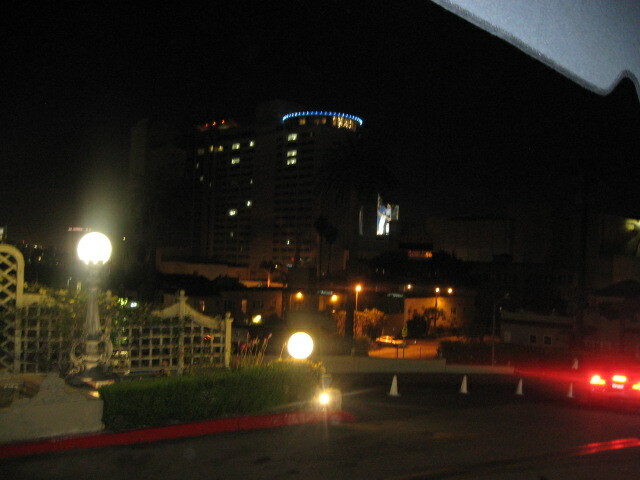 Magic Castle seen from the street after dark. 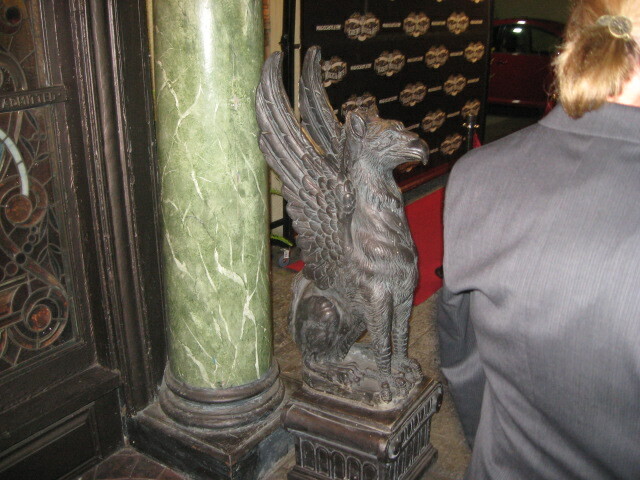 The entrance is guarded by a griffin. Valet parking, of course. 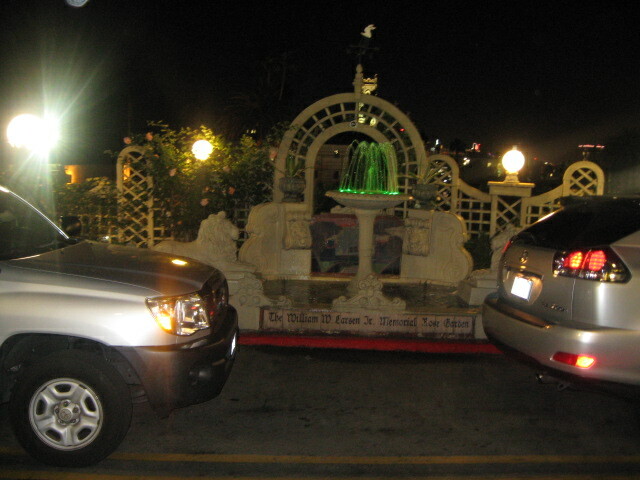 There is a lighted fountain outside the castle across from the door. 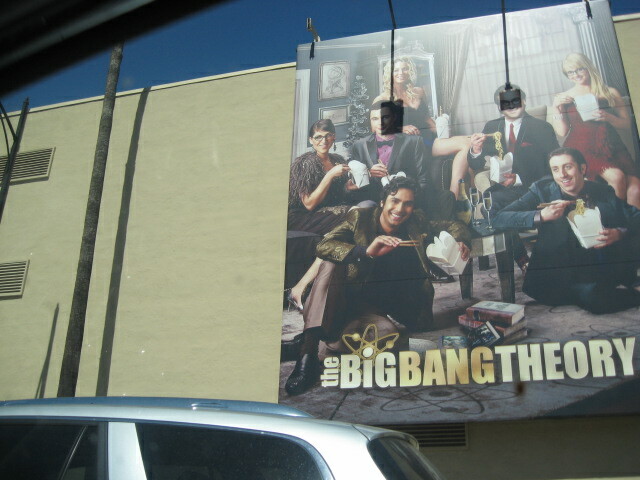 Big wall ad in Hollywood a couple of blocks from the Castle. 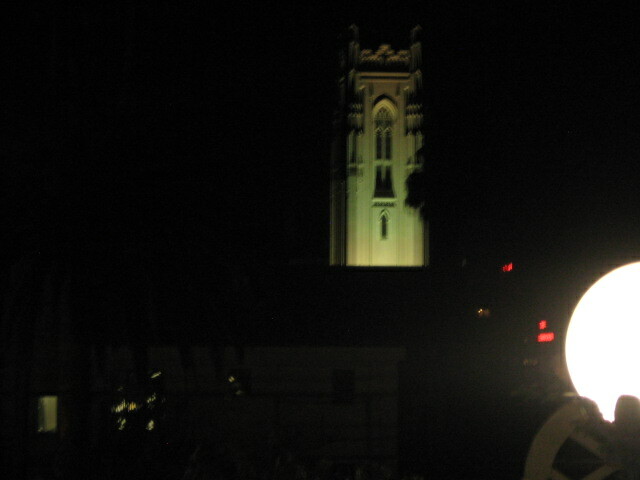 Distinctive tower in the neighborhood. Looks medieval. 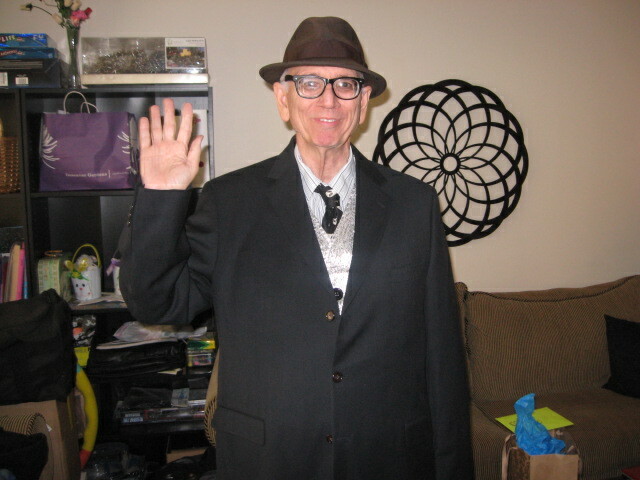 Mark Anthony says hi to all the viewers of Atroll’s Entertainment. 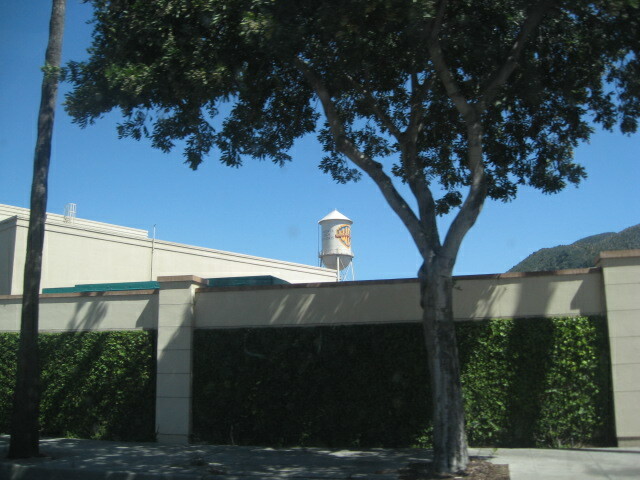 Stuff on the wall surrounding Warner Brothers. 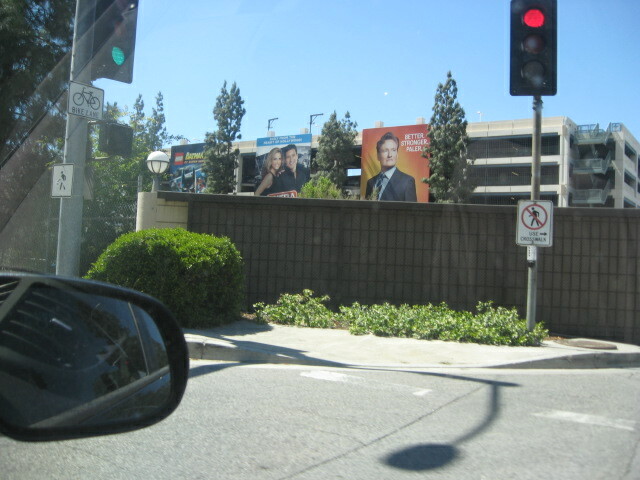 I was trying to find my way on my own to Hollywood on Monday. I got about halfway before I got lost. 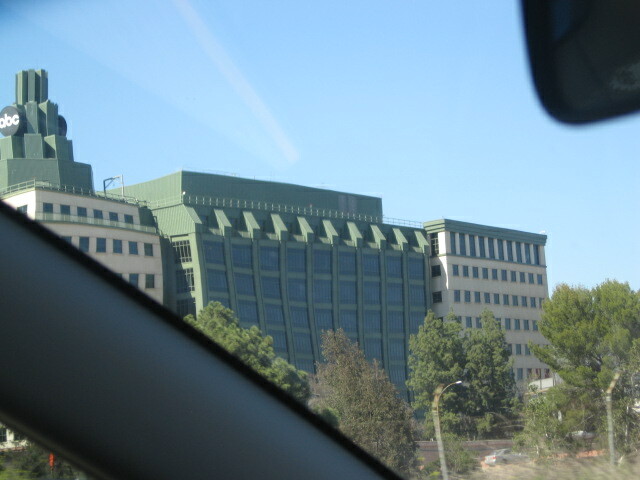 Warner Brothers has all these huge signs for their hits on the wall around the studios. 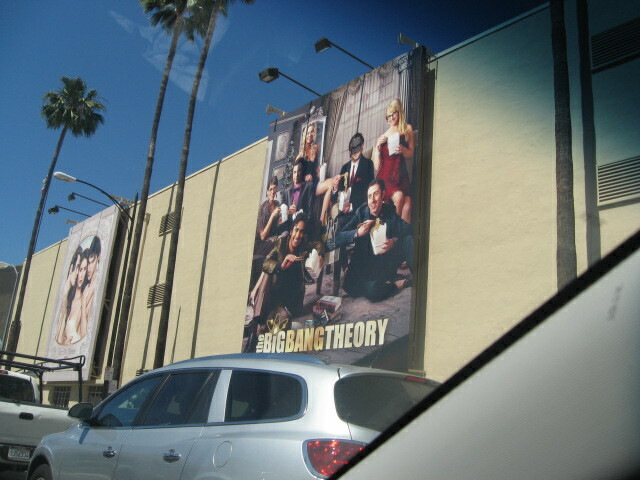 Big Bang Theory must be a big hit for Warner Brothers. 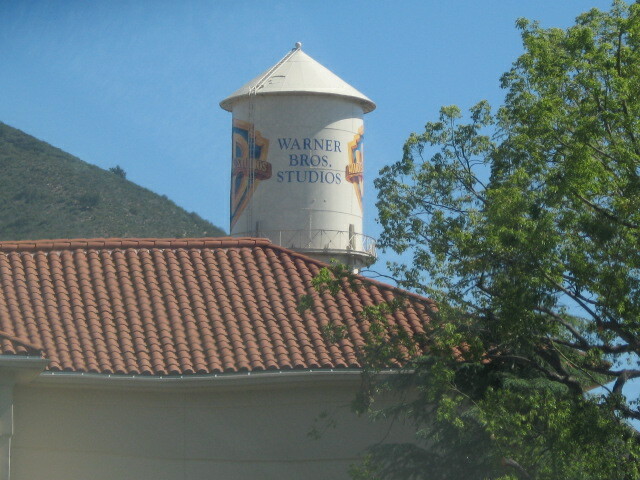 A distant view of the Warner Brothers water tower, made famous for me in the Animaniacs cartoon show during the 90s. 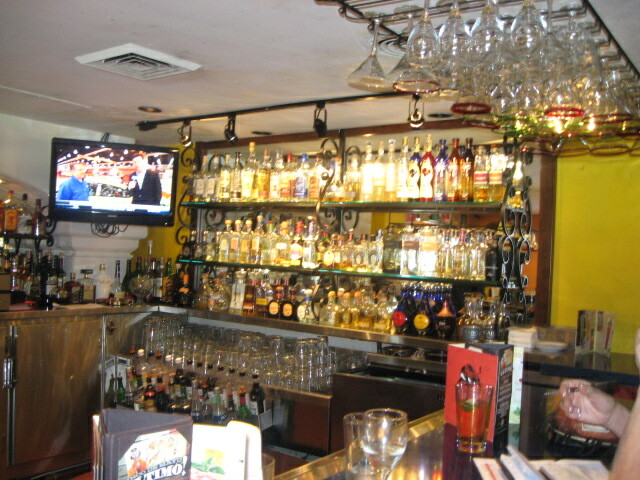 Totally lost, of course I wound up in a bar. 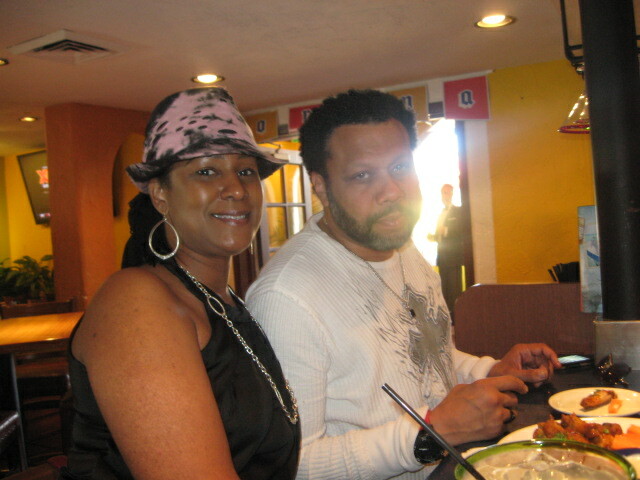 This is Dawn and Chris. I chatted with them in the bar and found out where I had gone wrong. But it was late afternoon, too late to try for Hollywood because we needed to get back to Mark’s place for our Monday night trip to the Castle. 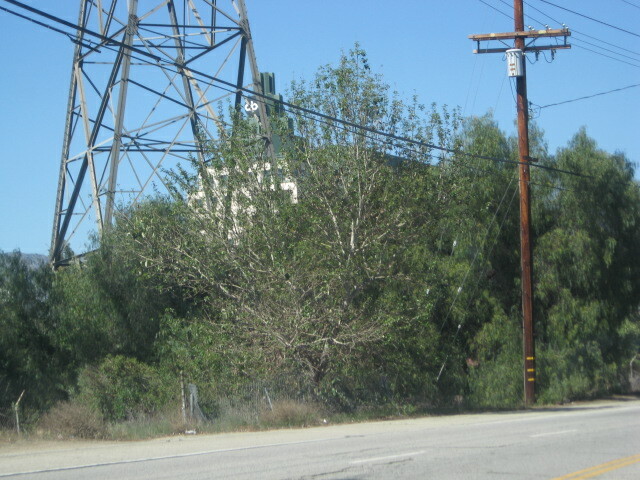 A better view of the Water Tower on our way back to Mark’s place. 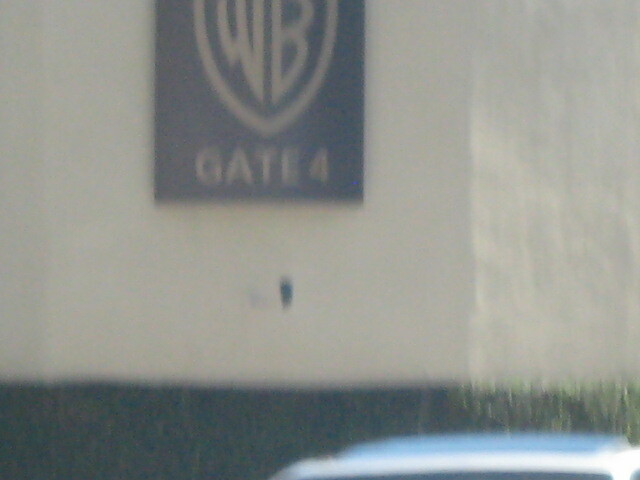 The Warner Brothers gate. Mark says we can get a tour here, and we might do that on my next visit. 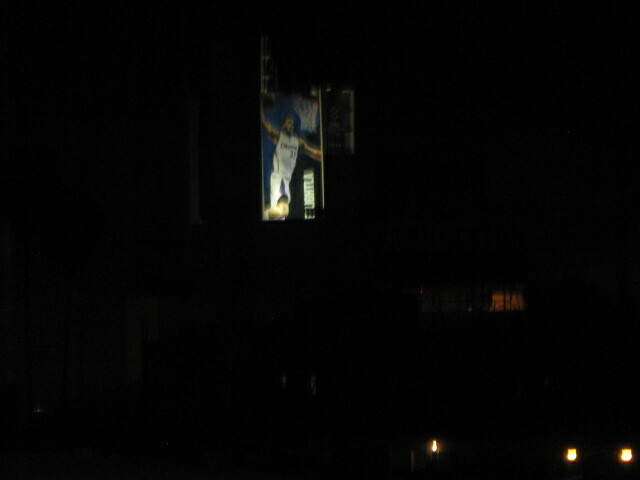 Terrible view of the ABC television studios. ABC was once my favorite television network. 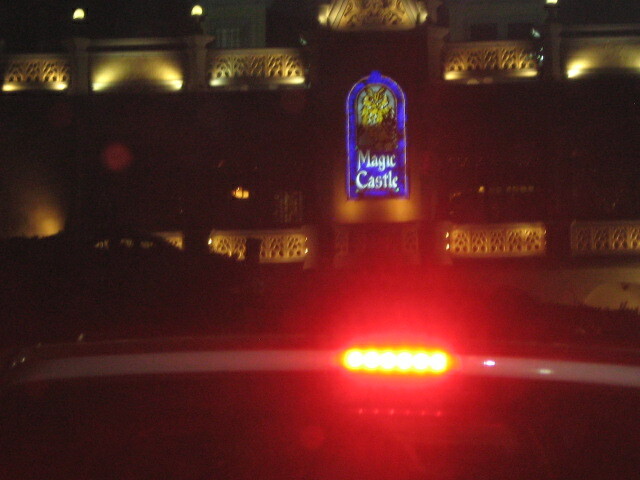 Magic Castle from afar seen through a hellish red glare. 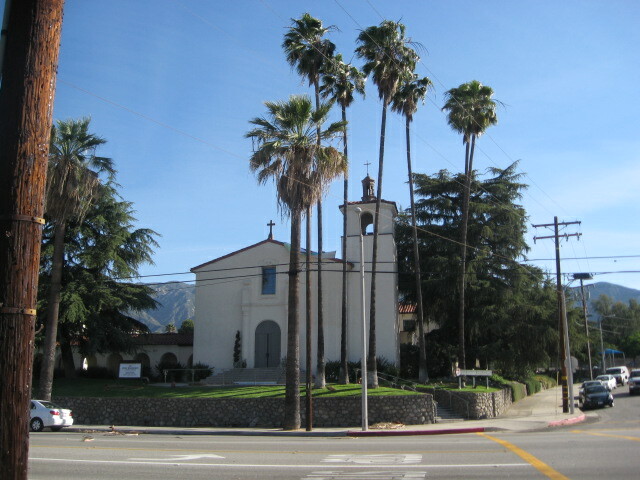 Tuesday morning, I took a morning walk with Mark around Montrose, California and found this old style Spanish church which Mark told me was only built ten years ago. Heh! 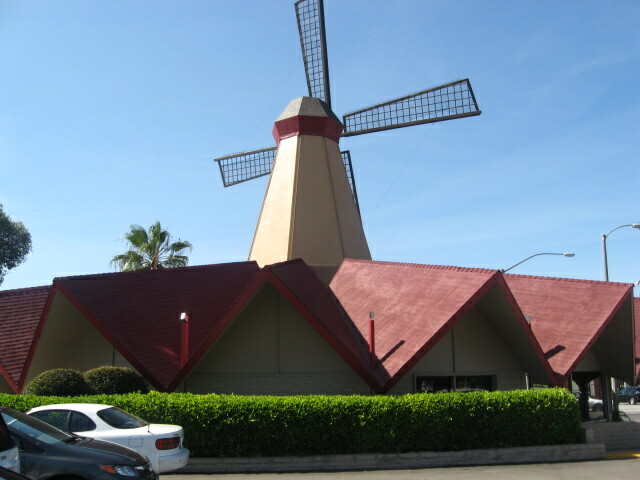 Looking for a place to have breakfast with James, I found a windmill. 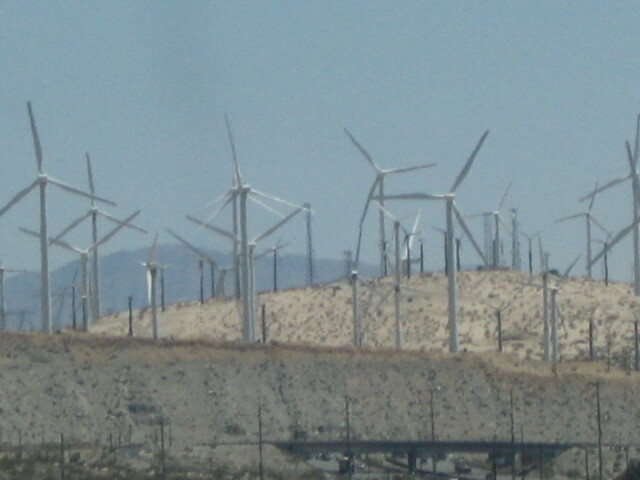 You don’t see many windmills that turn out to be . . .
Denny’s restaurants. 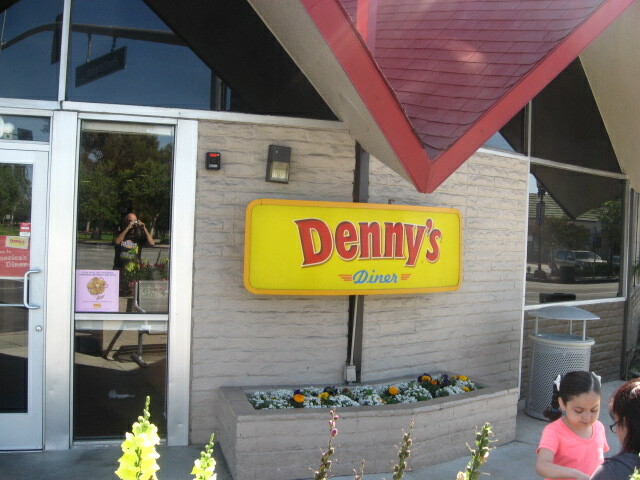 In fact this is the only Denny’s I’ve ever seen that isn’t just an ordinary cafe building. 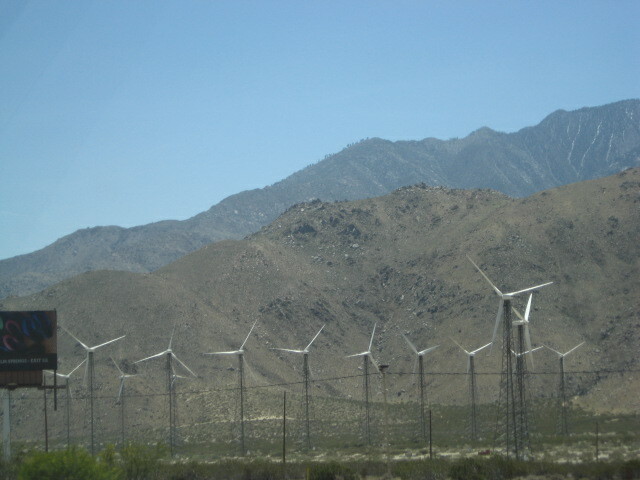 Heading east on I-10, approaching San Jacinto Peak and the pass between the desert and the San Bernardino area where there is a huge wind farm. 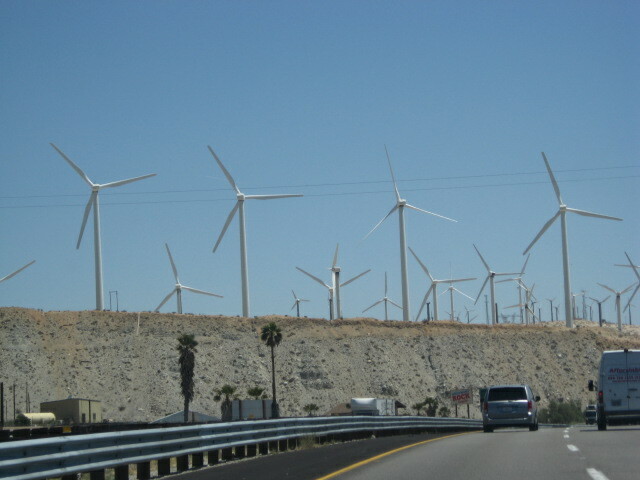 Speaking of windmills . . . Sometimes it looks like you’re going to drive right under them. 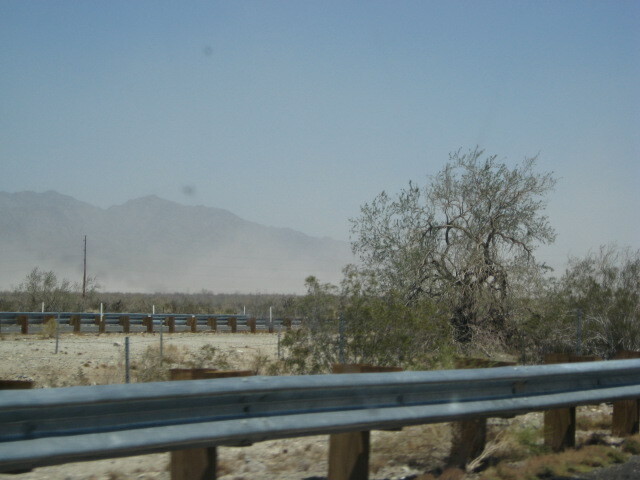 Crossing the desert, approaching Blythe. Very windy. The car was almost blown off the road. 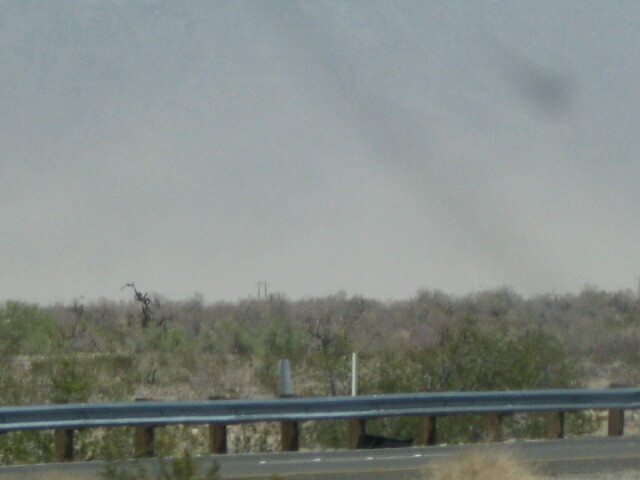 Dust storm visible in the distance. 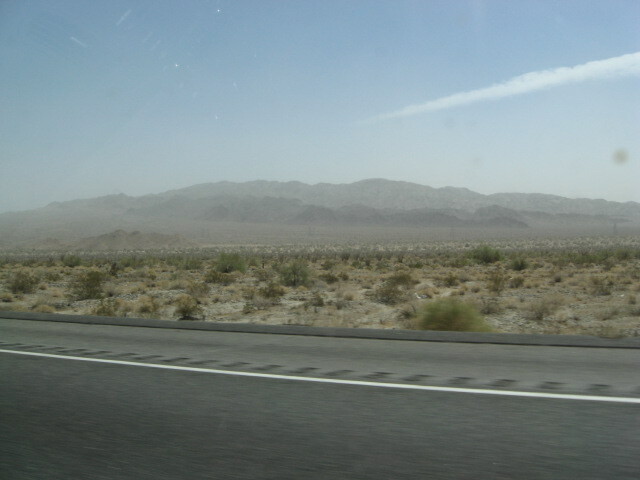 Back in Arizona now, the air has cleared up. 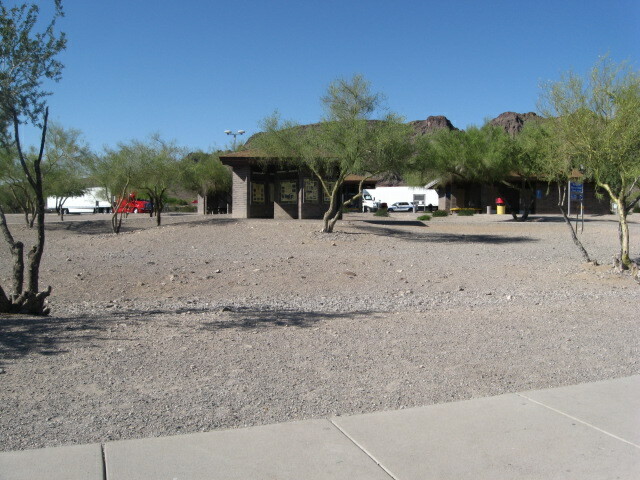 Rest stop west of Phoenix. We stopped for a bathroom break, and I went looking for striped stones. Didn’t find any. James is driving. I got to take some pix I’ve wanted to take for years. 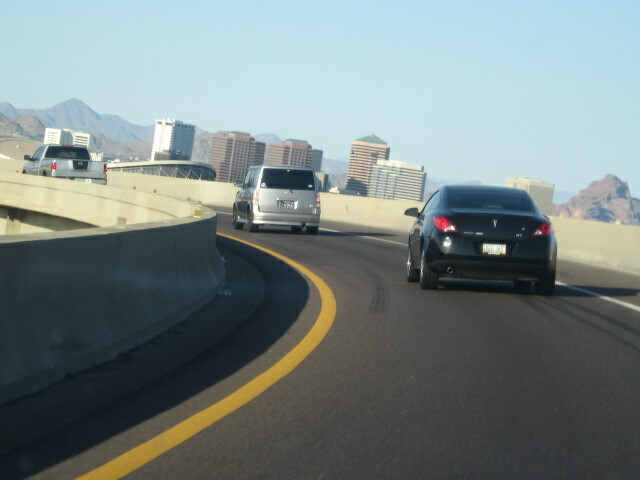 This is the skybridge ramp from I-10 to I-17 going north. 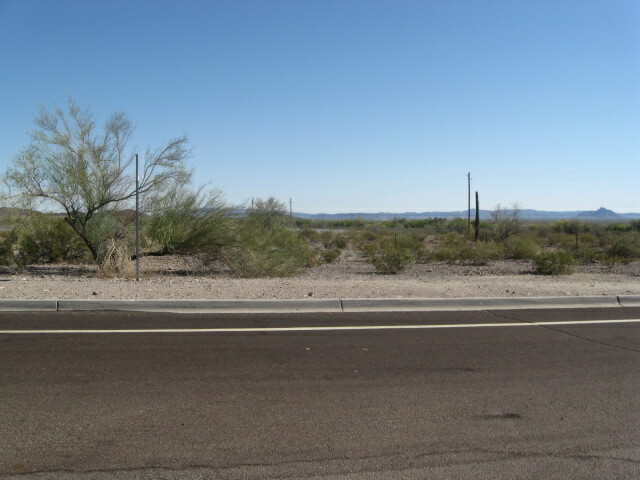 You can see midtown Phoenix in the distance. Last pic. 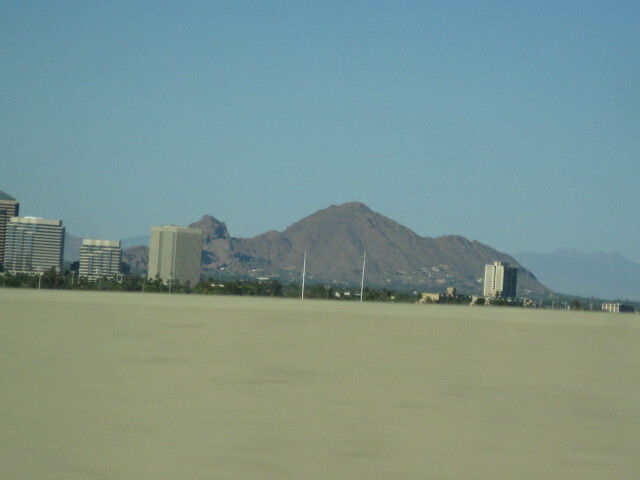 Camelback Mountain seen behind uptown Phoenix from the skyramp. 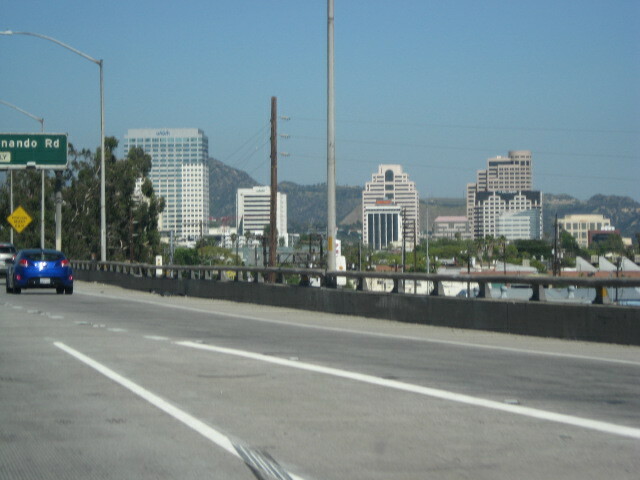 We were about 5 miles from home, and the great L.A. expedition was over. Alas, I’m back in the real world again, but the summer is young, and many more adventures await.